Glimpsed from a plane window, the beaches of the Silver Coast persuaded one couple from Durham to buy a custom-built home there . . . It was only after glancing out of a plane window and being wowed by the scenery thousands of feet below that Steve and Julie Pallister realised Portugal might after all have the perfect spot for their holiday home. Sure enough, in April 2018 the couple were handed the keys to their new villa, located 50 minutes north of Lisbon on that same stretch of the Silver Coast they had flown over two years before. They had their dream property built from scratch by a local builder, at a total cost of 290,000, including the land. Back then the Pallisters, whose home is in Durham, had just begun looking at options for a new holiday home, before that the couple had owned on Turkey's Bodrum Peninsula for ten years, selling it in 2016 after deciding it was time for a change. Second time round, they had decided against the Algarve, preferring somewhere less touristy and where property and day-to-day living costs were more affordable. They had considered Tuscany in Italy, and while they found it beautiful, property there was either too expensive or in need of too much work. After their aerial discovery of the Silver Coast, Steve and Julie got busy researching the local property market and it wasn't long before they flew out to do viewings with local agent Dylan Herholdt from Portugal Realty [www.portugal-realty.com], basing themselves near the town of Caldas da Rainha. "We had our eye on a new turn-key property that was part of a six-unit development near Obidos," continued Steve, who works in the oil and gas industry. "But when we went to view it we discovered that the builder had plans to grow the development into a small urbanisation. As we wanted to be somewhere less built up, we ruled out that option. We were so impressed by the builder though, we asked if he would build us a house just like the ones on the development if we found a suitable, more secluded plot to put it on, which he agreed to do." 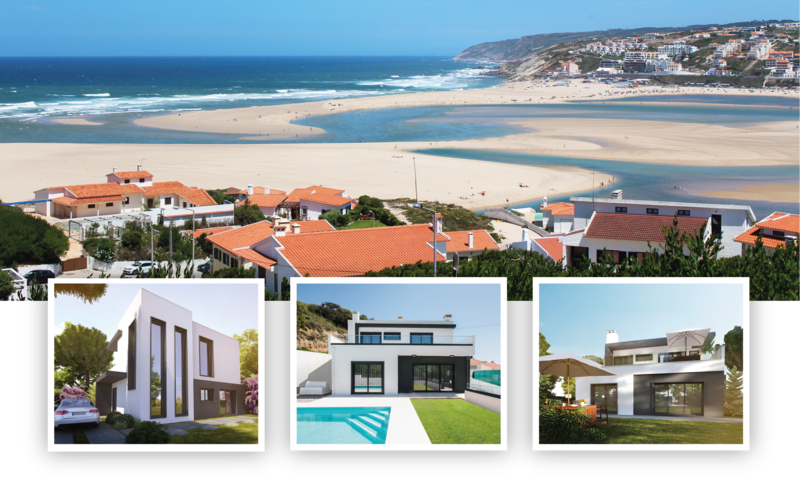 The agent Dylan immediately began scouting around and before the Pallisters returned to the UK, he had found them their perfect 600m2 plot, located in a hamlet called Venda Nova. "There are only about 10 houses there and it feels nice and rural," added Steve. "But we're only 2.5km or six minutes in the car from São Martinho do Porto. And the long sandy beach at Salgado is just a 15-minute walk." They then sat down with the builder and agreed a price to build their three-bedroom house. They also asked for the car-port to be converted into an extra fourth bedroom with en-suite. 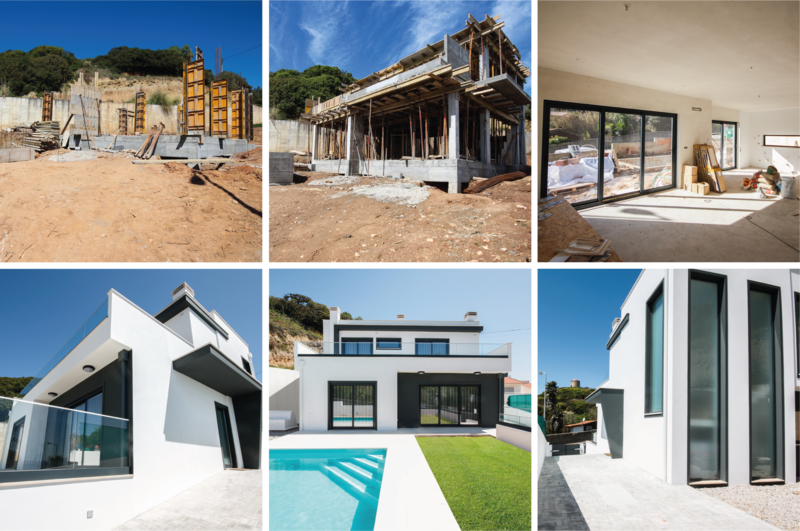 “The entire project, including the 7 x 3.5-metre swimming pool, kitchen, two bathrooms, all white goods, perimeter walls and car-port conversion worked out at around €230,000, or €1,500 per m2. That includes some upgrades and extras that we opted for, such as tiles, the kitchen fittings, underfloor heating in the bathrooms, a chimney for a wood burner and a pre-installation for air conditioning. We bought the plot separately for circa 60,000. Really, the only thing we've had to buy is furniture." It seems the couple were destined to look out that plane window two years ago and fall in love with the Silver Coast. It's slow, peaceful lifestyle is just what we wanted," said Julie. "It reminds us of how Britain used to be. The beaches are unspoilt and there are lovely old towns nearby like Caldas Rainha, São Martinho do Porto and Óbidos. “It's less touristy and more cultural than the Algarve, plus your money goes a lot further here, both in terms of property and day-to-day living. You can still have a lunch, beer included, in a local place here for around 5, and the food is always fresh, especially the fish and fruit and veg." Steve's work takes him abroad a lot but also means he gets long stints off, which is ideal for making regular trips out to Portugal. The couple have a busy few months ahead with children, grandchildren and friends planning visits to the villa-and who could blame them wanting to share their new holiday home! Article appeared A Place In The Sun Magazine, Autumn 2018 edition on Page 75.